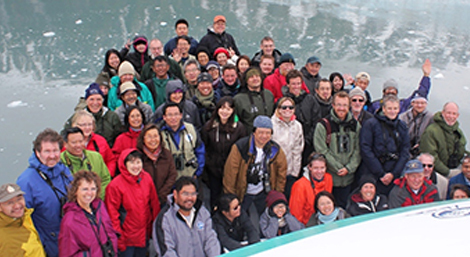 Participants on a field trip in Seward © 2013 EAAF Partnership. 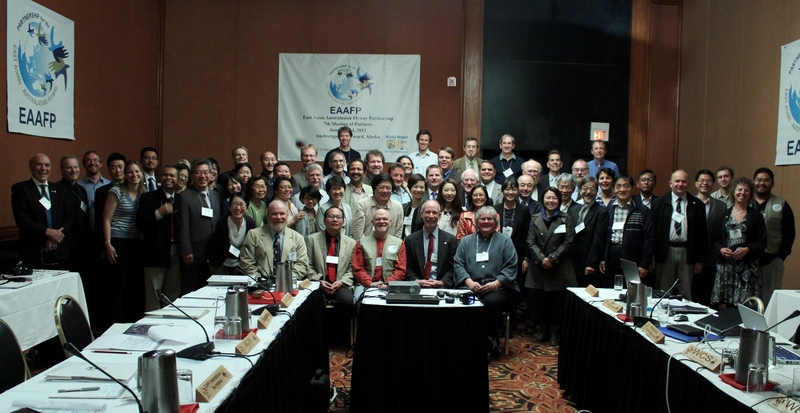 The Seventh Meeting of the Partners of the East Asian – Australasian Flyway Partnership (EAAFP) was held in Anchorage and Seward, Alaska, USA on 10-14th June 2013, hosted by EAAFP Partner, U.S. Fish & Wildlife Service.Three new Partners were welcomed at the Meeting: the Government of Malaysia, Wildlife Conservation Society and the Secretariat for the Conservation of Arctic Fauna and Flora (CAFF) of the Arctic Council. The total number of Partners now stands at 30, including 15 National Governments. 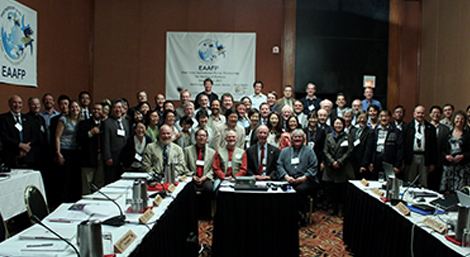 A Resolution of Cooperation was signed in Anchorage between CAFF and EAAFP, pledging to work together for the conservation of Arctic-breeding migratory waterbirds (To have more information about it, follow this link). In addition, five new sites were added to the EAAFP Flyway Site Network, from Malaysia (BakoBuntal Bay), Australia (Roebuck Bay and 80-Mile Beach), USA (Yukon Delta) and Japan (Arao-higata), the sites in Australia and USA being of critical importance for non-breeding and breeding waterbirds, respectively. During the Meeting, China was elected as the new Chair of EAAFP, with USA as Vice-Chair. Technical discussions centered around prioritization of shorebird and seabird species in the Flyway, as well as Network Sites. A new Task Force to address the recent precipitous decline of Baer’s Pochard (learn more) was formed and plans to advance conservation of inter-tidal habitats in the Yellow Sea were also agreed. The Spoonbill Sandpiper Task Force launched a video on the Journey of Spoonbill Sandpiper during Report-back session. The Partnership, adopted in the list of the World Summit on Sustainable Development (WSSD) as a Type II initiative – is an informal and voluntary initiative, which aims to protect migratory waterbirds, their habitats and the livelihoods of people dependent upon them within the Flyway. There are currently 30 partners including 15 national governments, four intergovernmental agencies, 10 international non-government organizations and one international business organization. For more information see our home page and more here. Background paper seabird priorities final. A – Seabird Priority List. B – Seabird Priority Rules.